These CDs come from major retail chain closeouts, liquidations and overstocks. The approximate retail value of these CDs were $11.99-$18.99. The mass majority of these CD's are full length, but there are a small amount of CD singles included in each order as well. Due to the nature of these buyouts we were able to purchase these inventories for penny's on the dollar and are now able to pass the savings on to you. Our smaller CD lots are perfect for the smart consumer looking to save on their music CD purchases. 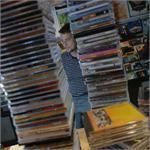 For you entrepreneurs out there we offer many larger bulk lots of CDs that are perfect for resale. These CD Lots are made from a random selection of CD's chosen from our massive 1,00,000+ CD inventory. They will include virtually all music genres; Rock, Rap, Country, Classic Rock, Techno, etc... Since these packages require minimal effort in sorting and packaging we are able to offer you our absolute lowest pricing possible, however if you do prefer certain music genre's over others we are always happy to accomodate requests as best we can. While we can not guarantee that we will be able to pack these CD lots exactly as you wish, make your requests known by mentioning them in the "Special Instructions" section of our checkout system.